Need to know some basic facts about Martha’s Vineyard? The following information should be able to help you to get a general sense of what to expect in terms of travel resources, Island towns and weather and attractions. What Will I Find in MV’s Six Towns? Seasonal and year round ferry service is the Island’s main link to the mainland. Additionally, Martha’s Vineyard airport is served by Cape Air and a number of charter companies on a year round basis. Cape Air flights that serve the Island depart from: Boston, White Plains, NY, Providence, Hyannis, New Bedford and Nantucket. Seasonally the airline serves Providence and Provincetown. An added attraction is their pet friendly policy. For flights to and from New York, Cape Air partners with Jet Blue for service via Boston. JetBlue and Delta also fly to and from the Vineyard non-stop from New York’s JFK Airport during the peak summer season. American Airlines service to the Vineyard departs Ronald Regan National in Washington DC. Tradewind Aviation offers scheduled flights from White Plains, NY and Teterboro, NJ. Cars can be brought to the Island via the Steamship Authority ferries. On-Island, rental car agencies, moped and bicycle rentals, taxis and the Vineyard Transit Authority’s Island-wide bus system provide additional travel options. In-season, tour buses depart frequently from all the Island’s ferry terminals and offer a complete loop of the Island offers Island wide scheduled bus service. July and August are the height of the tourist season, with August being the busiest month. July Fourth and Labor Day bring the biggest weekend crowds. June and September are also popular months for Vineyard travel and the rest of the year offers wonderful times to explore the Island, stroll the beaches, enjoy hiking the numerous wooded trails, enjoy exceptional dining and shopping and celebrate the holidays. Inns and hotels may offer discounted rates in the spring, fall and winter months. Island restaurants, shops and other businesses are open year-round. Special events highlight every season. Martha’s Vineyard is of course surrounded by beaches. The South Shore borders the Atlantic; beaches on the Vineyard & Nantucket Sounds (North Shore) and inlets offer calmer waters and are perfect for families with small children. Boating is a popular activity. There are cruises and fishing excursions, windsurfing, canoeing and kayaking opportunities. Rentals are available in every category. Other options for water sports include jet skiing, water skiing, surfing and para-sailing. Accommodations are numerous and vary from modest to luxurious. Hotels, inns and bed & breakfasts are available as are rental homes and apartments of all sizes. Visitors in July and August will want to plan their stay well in advance though last minute accommodations are always worth an inquiry. Farmer’s markets and farm stands, Island crafts, boutiques, gift shops, and antique stores line the downtown streets along with art galleries, a pottery studio and a glassworks. Martha’s Vineyard has several movie houses, a theater and a seasonal dance residency/performance center. Live music is featured at many of the Island bars, nightclubs and restaurants. The Vineyard is also known for its beautiful golf courses , a mini-golf course and the Flying Horses Carousel. Restaurants range from lobster-in-the- rough to world-class gourmet. There are plenty of grocery and convenience stores, as well as lots of places for take-out sandwiches, etc. In the summer farm stands, Farmer’s Markets and a Community Supported Agriculture program make sourcing local produce easy and fun. The Vineyard is a very popular destination for weddings. Ceremonies are held on beaches, in restaurants and in historic homes and private estates that can be rented for parties. June and October are the most popular months for Vineyard weddings and accommodations and sites should be booked well in advance. All the goods and services for a wedding of any size can be found on the Island. 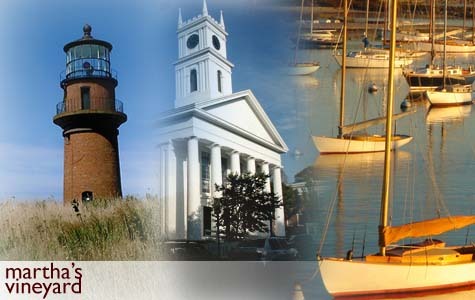 With so much to offer, a visit to Martha’s Vineyard is yours to enjoy whenever you come and whatever you do. We hope we can welcome you soon. For even more insider tips before you travel, order the 2018 Martha’s Vineyard Island Guide, with up-to-date suggestions and local favorites. Need to know more? Explore our list of visitor resources by clicking on the topics provided on the sidebar at the top left of this page.